Lisa Auerbach Baum is a nationally board-certified, PA state licensed Pediatric Occupational Therapist who has been working with children, infants through adolescents, for over 30 years. Lisa attended Temple University, College of Health Professions for both her undergraduate and graduate studies in Occupational therapy. Lisa is certified in the administration and interpretation of the Sensory Integration Praxis Test (SIPT) She is a member of the American Occupational Therapy Association, Pennsylvania Occupational Therapy Association and Specialists of Schools Organization. Lisa’s “occupations” other than KIDSPLAYWORK include hanging out with her 2 –twentysomething year old daughters, reading, practicing yoga, gardening and swimming. 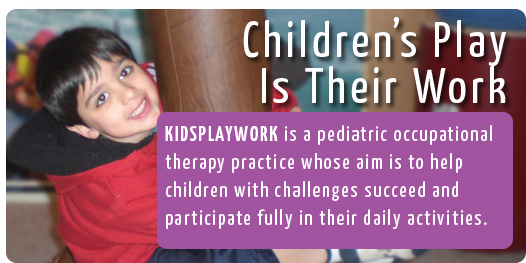 To get started, please contact Lisa at 215-782-2242 or email kidsplaywork@yahoo.com. An initial intake will then be taken and an initial consult session or full evaluation testing session will be scheduled. A holistic approach is used in assessing all clients and questionnaires regarding daily routine (including sleep hygiene and nutritional diet), medical, developmental and sensorimotor histories are used along with standardized testing to determine the need for OT intervention. Treatment focuses on providing the client with a comfortable environment in which he/she can develop, learn and refine skills while having fun! Coping strategies, self-calming and focusing techniques are emphasized in treatment. An integral part of the OT program is the incorporation of a sensory diet (a prescribed set of activities that provide sensorimotor input) and home program to help clients achieve their OT goals. Consistent attendance to OT sessions (usually on a weekly basis) is essential for achievement of OT goals agreed upon by family and therapist. Fees for services vary according to service requested and will be determined at time of initial intake. Fees for services are due at the end of each appointment and payable in cash or check only. Clients will receive a receipt for services rendered, which may be submitted to an insurance company for reimbursement as per individual coverage. The receipt will include information requested and accepted by most insurance companies (not HMO’s), such as diagnosis (prescription needed from pediatrician), type of service provided and fees. OT services need to be deemed medically necessary to obtain reimbursement. 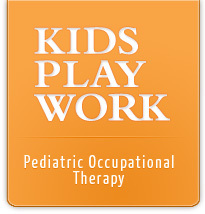 KIDSPLAYWORK does not directly accept insurance reimbursement or submit claims directly to insurance companies.